2017 marks the 500 year anniversary of the Reformation and on this very special journey following in the footsteps of Martin Luther, see where it all began. Starting in Berlin, visit the Kaiser Wilhelm Memorial Church and take pictures of Brandenburg Gate and the Holocaust Memorial. 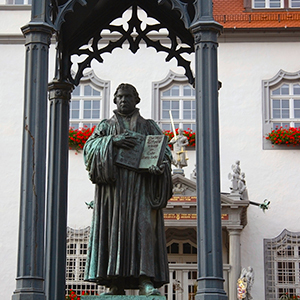 In Wittenberg, see Luther House, and visit St. Mary's Church and Melanchthon House. Continue to Leipzig to visit the Thomaskirche, where J.S. Bach worked. 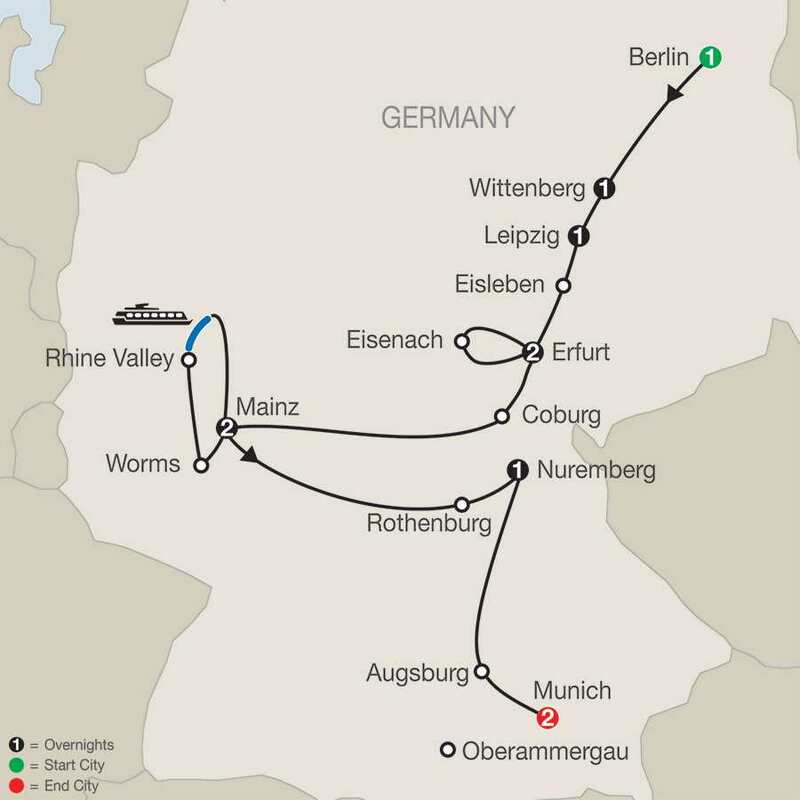 Also included are visits to Luther's Birthplace Museum, Luther's Death House Museum, St. Andrew's Church, and St. Peter & Paul Church in Eisleben; the Augustinian Monastery and Merchant's Bridge in Erfurt; Wartburg Castle, where Luther translated the New Testament, Luther House, and St. George's Church in Eisenach; Coburg Fortress; and Worms, where the Imperial Council passed judgement on Luther in 1521. Visit the cathedral where Luther presented his case, Trinity Church, and the famed Reformation Monument. Enjoy a romantic Rhine River cruise through the prettiest part of the Rhine Valley and in Mainz, visit the Gutenberg Museum. Next is the medieval walled town of Rothenburg, famous for its Christmas ornaments, to visit St. Jacob's Church with the renowned Blood Altar. Follow in Luther's footsteps to Nuremberg and visit St. Lorenz Lutheran Church, and to Augsburg, where Luther and his followers proclaimed their beliefs. End in Munich and visit Marienplatz with its Old and New Town Halls. An optional excursion to King Ludwig's Linderhof Castle and the Passion Play town of Oberammergau is available. In the evening, enjoy a farewell dinner at your hotel. For single and triple rates, please contact your group leader Pastor Maas. Price includes: land tour, sightseeing, hotels and meals as specified in the itinerary (daily breakfast, 7 three-course dinners with wine), and the services of a professional tour director. *Dates, prices and itineraries are subject to change. Name & deposit by November 29, 2016 and save 10% off the land price! Air price based on group air, must have at least 10 passengers traveling from same gateway, with deposit received 210 days prior. Travel Protection Plus is available for an additional $209.00 per person. Travel Protection Plus: (Must be purchased at the same time of initial deposit) For those who purchase the Globus Travel Protection Plan, Globus provides the Travel Protection Plus Plan as well. This plan allows you to cancel your vacation up to 24 hours, (or the prior business day, whichever is farther out) before the scheduled departure for any reason. Under this Travel Protection Plus Plan benefit, cancelling for a covered reason will result in a cash refund, minus travel protection premiums. In the event a passenger cancels for a non-covered reason, Globus will reimburse the cancellation penalty amount in travel certificates, minus the plan cost. Additional terms may apply. Please visit www.tripmate.com/wpF372G/home for covered and non-covered reasons. *Travel Protection rate is based on the land cost of the tour. Rate may vary with additional land services i.e. single supplements, extra nights and cabin upgrades. Price Disclaimer: your air-inclusive price will include all applicable air taxes, surcharges and fees, including a September 11th Security Fee of up to $10, passenger facility charges of up to $18, Federal domestic flight segment fees of up to $3.70 per segment, and U.S. and International arrival and departure and other government imposed fees applicable for your itinerary at the time of booking. Your final air-inclusive vacation price is guaranteed when your air schedule has been confirmed and your full air and land deposit have been received. No included in your vacation price - airport transfers on non-qualifying flights; additional airline fees for baggage may apply and are available by carrier from the website www.iflybags.com; applicable cruise taxes, fees, fares and port charges; passports; visas and vaccinations; transfers; tips to your Tour or Cruise Director, Local Host, driver, Local Guides, and/or ships' crew; gratuities on ferries, trains, and cruise ships; laundry; telephone; minibar; alcohol, beverages, and food outside of the contracted menu as presented at a hotel or restaurant (these extra items will be billed to you before leaving the hotel, ship, or restaurant); additional excursions and activities not listed as 'included' in the itinerary; porterage at airports or train stations; Travel Protection premiums; and all other items of a personal nature. For return travel from some countries, prices do not include airport and/or departure taxes of up to $45, which may be collected by the foreign government. 1. The purchase/payment of any travel services offered by Group Voyagers, Inc., authorized to do business as Globus (hereinafter Globus), constitutes a contractual arrangement between the Traveler (you) and Globus, and represents your acceptance of the Globus Terms & Conditions. You must be at least 18 years of age to make a booking. As the lead traveler, you accept, and confirm you have authority and consent to accept, these Globus Terms & Conditions for yourself and all members of your traveling party. 	For vacations that include Botswana, a $1,000 per-person, non-refundable land deposit is required to reserve space for you. 	For vacations that include Botswana final payment is due 90 days prior to the commencement of services. 	For vacations that include a cruise on the Seaman Journey, and Galápagos Legend, final payment is due 90 days prior to the commencement of services. 	For vacations to Greece, Israel, Jordan and all other Globus vacations to South America, Asia, South Pacific, and Africa, Escapes by Globus, final payment is due 60 days prior to the commencement of services. 27. Cancellation fees may also apply to any additional services, including extra night accommodations, independently supplied services, and optional excursions reserved prior to, during, and after the tour. If flight changes, including, but not limited to, flight cancellations or name changes, are requested after full land and air deposits are received, revision fees, change fees, or airline cancellation fees will apply (see Revision Fees below). In many instances, airline revision or change fees can be up to $300, but in some instances may be up to 100% of the ticket price. Cancellation penalties will be quoted at time of cancellation. 28. Travelers who are under 18 years old on the departure date must be accompanied by an adult throughout the vacation and are requested to share an adults accommodation. 32. On the New Years Down Under (PY/E) tour, travelers must be 18 years of age or older. 34. The following young traveler discounts apply to Globus vacations. Special discounts may be available for tours booked as Private and will be communicated at time of booking. The below discounts apply when sharing accommodations with two adults. To receive the young travelers discount, the age of the traveler must qualify at commencement of services. 	On Globus escorted vacations, young travelers ages 8-17 receive a 10% discount on the base land vacation price, except those with a Galápagos cruise on the Galápagos Legend or Seaman Journey, for which there is no discount. 35. Due to limited capacity on safari vehicles and flights when on safari, your single bag must be soft-sided with dimensions not exceeding 30x21x11 (62 linear dimensions) or weight exceeding 33 lbs (15 kg), including hand luggage, for vacations in Kenya and Tanzania; dimensions not exceeding 30x21x11 (62 linear dimensions) or weight exceeding 44 lbs (20 kg) in South Africa, Zimbabwe, and Botswanas Chobe National Park; or dimensions not exceeding 26x12x10 (48 linear dimensions) or weight exceeding 44 lbs (20 kg) in Botswanas Okavango Delta..
51. In the sole discretion of Globus, Globus may refuse transport to any passenger or may require any passenger to leave the tour if it is reasonably believed that the passenger (1) is dangerous to others or to himself or herself; (2) has engaged in, is engaged in, or is threatening to engage in, behavior that may adversely affect the safety, security, comfort, enjoyment, or well-being of other passengers or Globus representatives, including, but not limited to, behavior that is disruptive, verbally abusive, physically abusive, obnoxious, harassing, discriminatory, or obscene; or (3) has failed or refused, or is failing or refusing, to follow Globus rules and procedures or the instructions of Globus or its representatives. In the event a passenger is removed, such passenger may be left at any city without any liability to Globus or its representatives. Globus shall not be required to refund any portion of the price paid by any passenger who is removed under the terms of this paragraph, nor shall Globus be responsible for expenses for lodging, medical care, meals, transportation, or any other expenses incurred by the passenger. Globus shall be entitled to recover from the passenger any costs or expenses incurred by Globus or its representatives in the removal of the passenger or the exercise or enforcement of this clause. 53. Your single bag should have dimensions not exceeding 30-x21-x11- and weight not exceeding 50 lbs (22 kg). We regret that we are unable to accept a second suitcase or any luggage exceeding these limits on any Globus vacation. Some vacations have more restrictive regulations than those listed above. Refer to your Travel Documents for more information. 54. Air carrier restrictions may vary from the limitations listed above. Size and weight limitations for carry-on and checked baggage vary from airline to airline and even according to destination. While making an air-inclusive booking, you will be provided with baggage fee information. After booking an air-inclusive booking, up-to-date information on carrier-specific standard checked baggage allowance (including size and weight limitations), the standard allowance (and fee, if applicable) for carry-on baggage, and the standard fee for the first and second checked bag, along with the information about additional discounts that may apply depending on flyer-specific factors (e.g., frequent flyer status, military, credit card used for purchase, or early purchase over the Internet, etc. ), can be found on the carriers website or by accessing iflybags.com. Globus is not responsible for additional fees imposed by air carriers for baggage, and these fees are not included in the air-inclusive vacation price. You will be required to pay these fees directly to the airline at check-in. 55. No responsibility is accepted by Globus for loss of or damage to baggage or any of the travelers belongings throughout the duration of the vacation. Travelers are strongly encouraged to not bring valuables such as jewelry and large amounts of cash. Any such valuables should not be left in baggage out of the control of the traveler. Baggage insurance is recommended. See the Globus website or back of this brochure for an all-inclusive Travel Protection plan. 60. All passengers must provide emergency contact details and passport/government issued ID information (when required) prior to travel. This includes a Local contact so that Globus can get in touch with friends or family in the rare case of an emergency as well as an On Tour contact, i.e. mobile phone number or email address, for use by the Tour or Cruise Director. Emergency contact details can be provided through your travel agent or in your My.GlobusJourneys.com account. 61. All Tour Directors, Local Hosts®, Local Guides, and ships crews speak English, and all vacation commentary and instruction are conducted in English only. For maximum enjoyment and understanding, you must be able to read, understand, and speak English. 65. Gratuities are included for services during the land stay of your vacation, unless otherwise noted above. This includes wait staff at included meals, hospitality staff at hotels for nights purchased through Globus, and porterage at hotels for one suitcase per person. Gratuities for your Tour Director, Local Hosts®, Local Guides, driver, and ships crew are not included in the vacation price (unless otherwise noted in pricing details) and are discretionary. 74. Air-conditioning in hotels is not guaranteed and dependent upon local and national laws and regulations. Though hotels may have air-conditioning as a listed amenity, the usage of air-conditioning is often not available at night or in the off-seasons (OctoberMay). Other restrictions may apply. Globus has no control over air-conditioning restrictions and regulations. 81. The following charges are not included in the land/cruise vacation price, unless otherwise noted: airfare to and from the start of your vacation; intra-vacation air, unless specified in the itinerary; airline baggage fees, including checked and/or excess baggage fees; Federal inspection fees for U.S. Immigrations & Customs; International Air Transportation tax; agricultural tax; other per-person taxes imposed by government entities; airport taxes and fees, including the September 11th Security fee up to $11.20 per person, passenger facility charges up to $18 per person, Federal domestic flight segment fees up to $4.10 per segment, and U.S. and international arrival and departure and other government-imposed fees added by the airline and applicable at time of booking; port taxes; passports; visas; vaccinations; tips to your Tour Director, Cruise Director, Local Host, driver, Local Guides, and/or ships crew; gratuities on ferries, trains, and cruise ships; laundry; telephone; minibar; alcohol, beverages, and food outside of the contracted Globus menu as presented at a hotel or restaurant or on board your vessel (these extra items will be billed to you before leaving the hotel, ship, or restaurant); airport transfers on non-qualifying flights; optional excursions; porterage at airports and train stations; Travel Protection; and all other items of a personal nature. 82. Optional excursions (the Services) available for booking are provided by local operators or other third parties that are entirely independent of Globus and do not form any part of the product or services sold to you by Globus or of these Terms & Conditions, even where Globus suggests particular operators/other third parties and/or assists you in booking such optional shore excursions. Your contract for such Services will be with the organizer or operator of that Service, and will be subject to its Terms & Conditions, which may contain exclusions or limitations of liability. Globus has no liability for any such optional excursion or for any act(s) or omission(s) of the organizer or operator or for any of its employees or agents or any other person(s) connected with the optional excursion. 89. Once Globus has received your full land deposit for any cruise vacation, that land price is guaranteed and you are protected against any base land price increase due to currency surcharge. Any subsequent land or cruise cost increases are at Globus expense, not including energy cost increases and/or any government tax increases. 99. After returning from your vacation, if you wish to inquire about any services provided, ensure that all correspondence relating to those services is received by Globus, Traveler Services, Group Voyagers, Inc., (see address under Responsibility). Any complaint or claim involving the vacation services offered in the Globus brochure or on the Globus website, involving the negligence of any suppliers, sub-contractors, or agents in relation to any service provided to the vacation participant, must be notified to Globus while on vacation or within 30 days of the vacation completion, except where such time limitations are prohibited by law. 104. Globus reserves the right to cancel or reschedule any vacation departure for any reason, including insufficient demand or force majeure (see section 58 above). If a vacation is canceled prior to departure, Globus only responsibility will be to refund the amount received for the reservation. Globus will try to rebook the same vacation with a different departure date, or a similar vacation, but there is no guarantee of availability of offering. For air-inclusive vacations, Globus will try to confirm air schedules for the selected new dates, subject to availability. Globus cannot assume responsibility for any additional costs or any fees relating to the issuance and/or cancellation of air tickets or other travel arrangements not made through Globus. 106. Passenger Travel Documents, including e-ticket itineraries, are available approximately 23 weeks prior to departure, provided full invoice payment, emergency contact details and passport/government issues ID information (when required) has been received. If available, additional service changes and/or shipping fees will be required for documents requested early, early air ticketing, alternate delivery options (including delivery to multiple addresses), for printed documents for Escapes vacations (2019 vacation only), and for any delivery outside the continental United States. Expedited delivery charges are required for reservations made within 45 days of the commencement of services. Charges will be quoted at time of reservation and/or request. There are no printed documents available for Escape in 2020. 111. 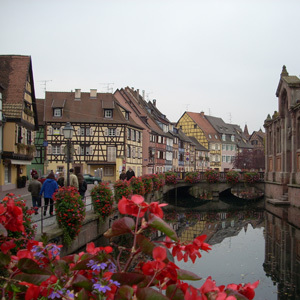 Not all sightseeing stops/sites accommodate wheelchairs, and some locations and sightseeing activities require extensive standing, sitting, or walkingsometimes on unpaved or cobblestone streets. Globus will not refund or cover any cost or expense incurred for any missed activities due to a participants inability to fully participate with the group. The Americans with Disabilities Act is only applicable within the United States, and facilities for disabled individuals are limited outside its borders. Most transportation services, including the touring motorcoaches and cruise ships, are not equipped with wheelchair ramps. Although some of our ships have elevators, many small ships do not. Passengers requiring ship elevators should inquire before making reservations. 118. During the course of your cruise, tour, or excursion, you may encounter the opportunity to participate in additional, optional activities that are provided by independent third-party suppliers. The suppliers of those optional services may render those services subject to separate and additional terms and conditions, or may require you to execute additional documents, waivers, or releases. It is understood that any assumptions of liability, waivers, or releases that are part of the suppliers terms and conditions or that are required by those independent suppliers will also inure to the benefit of Group Voyagers Inc., Avalon Waterways, Globus, Cosmos and Monograms. 120. Group Voyagers, Inc., located at 5301 South Federal Circle, Littleton, Colorado 80123, is an independent company (the Company) licensed to market and distribute travel products under the Globus, Cosmos, Avalon Waterways and Monograms brand names, and arrange for the vacation services offered on this website or in the brochure, including transportation, sightseeing, and accommodations through independent contracts. 121. Air carriers, accommodations, and other suppliers (including, but not limited to, trains, cruises, ferries, motorcoaches, hotels, and restaurants) providing services are independent contractors and are not agents, employees, servants, or joint venturers of the Company or its affiliates. From time-to-time, and for the purpose of identifying those independent third-party suppliers of services as the provider of a component or part of a Globus cruise, package or tour, some or all of those entities may utilize the name Globus on promotional media, signage, or attire. Although you may see the name Globus on vehicles, signs, apparel, or elsewhere during your cruise, tour, or excursion, its use by third-party suppliers is solely for the purpose of identification and does not represent or signify in any way ownership, management, supervision, or control by the Company of services that are provided by independent third party suppliers or of the employees, servants, or agents of the third-party suppliers. All certificates and other travel documents for services issued by the Company are subject to the Terms & Conditions specified by the supplier, which are available upon request, and to the laws of the countries in which the services are supplied. 122. The international carriage of passengers is subject to international conventions and treaties, where applicable. These international agreements limit and, in some events, exclude the carriers liability to passengers (vacation participants). Where any claim or part of a claim (including those involving death or personal injury) concerns or involves any travel arrangements (including the process of getting on or off the transport concerned) provided by any air, sea, inland waterways, rail or road carrier, or any stay in a hotel, the Companys maximum liability is the maximum that would be payable by the carrier or the hotel keeper concerned under the applicable international convention, treaty, or regulation applicable to the travel arrangements or hotel stay (e.g., the Warsaw Convention, the Montréal Convention for international travel by air, the EU Regulation on Air Carrier Liability for air carriers with an operating license granted by an EU country, the Athens Convention for international travel by sea) in that situation. 127. Arbitration against the Company or the vacation participant shall be invoked in writing under the laws of the State of Colorado within a period of 12 months following the date of completion of the vacation and not later. Neither of the parties nor any affiliate of the Company shall in any case be liable for other than compensatory damages, and they hereby waive any right to claim punitive damages. The Governing and substantive law for the Arbitration proceedings would be laws of the State of Colorado, USA. The prevailing party shall be entitled to an award of costs and reasonable attorneys fees. 128. Any action to enforce the arbitrators decision shall be brought only and exclusively in the state or federal courts in the State of Colorado, USA.